Thanks to those magnetic strips on the back of credit cards, you can pay for gas at the pump or buy groceries at the checkout with one quick swipe through a card reader. No more clunky manual card imprinter. But while you've grown accustomed to that convenience, thieves have used the technology to create a new kind of fraud--card skimming. It's one more danger you must guard yourself against and another maddening example of how crooks find ways to turn technology on its head. Crooks then remove the phony device and use the stored information to buy stuff online or write the data onto new magnetic strips to make counterfeit credit cards or ATM cards. The newest skimmers are outfitted with radio devices, which send the information over a cellular network to the bad guys, giving them instant access to your credit card data. Portable skimmers--small enough to fit in a palm--can be used by anyone who handles your credit card, such as a waiter. All he has to do is get your card out of your sight for a second. That's enough time to swipe it through the device, and steal your information without you suspecting a thing. Fortunately, the good guys are making advances to thwart card skimmers. MagTek Inc., the largest provider of transaction security products, has developed a credit card authentication system, which allows card readers to tell the difference between a real credit card and a counterfeit. Visa Inc. and Fifth Third Bancorp are testing the new system, The American Banker reported. • Don't let your credit card out of sight. Watch carefully anyone who handles your card. 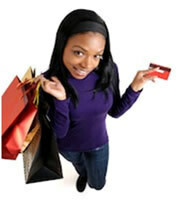 • Keep track of receipts and check your credit card statements regularly to make sure you authorized all purchases. • Report any unauthorized purchases immediately to your credit card companies. • Don't use a credit card reader if there are any signs of tampering. Don't swipe your card through devices that offer to clean the magnetic strip. Those are scams designed to capture your credit card information. 0 Responses to "Credit Card Skimming: How to Protect Yourself"